Help -- clicking this will display DXKeeper's online documentation in your web browser. Below the row of buttons you'll find an unlabeled table called the Log Page Display which is used to display QSOs in your log; at this point, the Log Page Display is empty, because you've not yet created a log. Below the Log Page Display are panels that let you sort and filter the Log Page Display; ignore these for now. To create a log, select the Config window's Log tab, and then in the Log file panel at the top click the New button; a window entitled Create new log: navigate to folder, and specify filename will appear. Your log file can be placed anywhere on any hard drive on your PC, and DXKeeper will automatically remember its location and open it for you each time you start the program, but its suggested that you place your log in your DXKeeper folder, and used your callsign (omitting any slashes) as its filename . Click the Create new log... window's Open button, and you're ready to start logging QSOs. Click the Capture button to display the Capture window, which is designed for real-time logging. 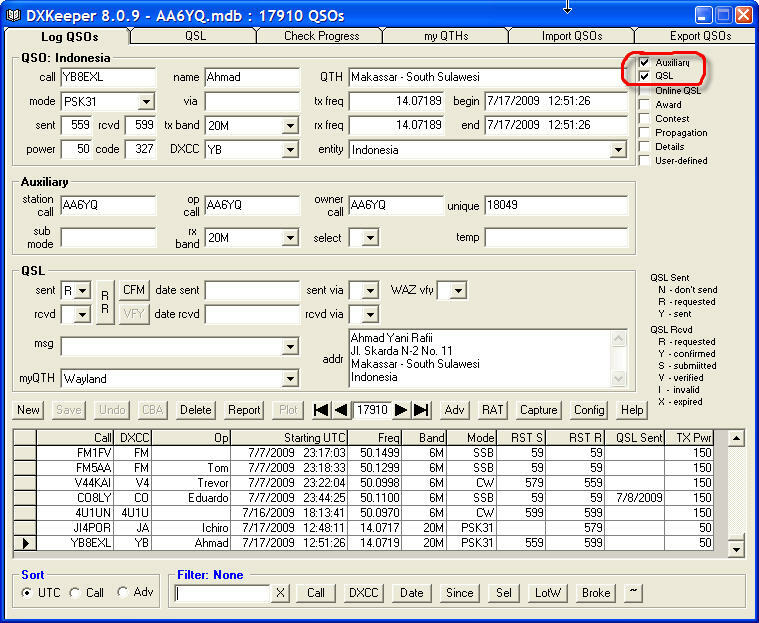 Type a callsign into the Capture window's Call textbox and strike the Tab or Enter keys; if you have access to a Callbook configured and enabled, information it provides will be placed in the appropriate Capture textboxes. Record additional information as desired, e.g. name, signal report, QTH, notes. If you're controlling your transceiver with Commander, the frequency and mode will be automatically recorded in the Capture window; otherwise, you'll need to type these in manually. 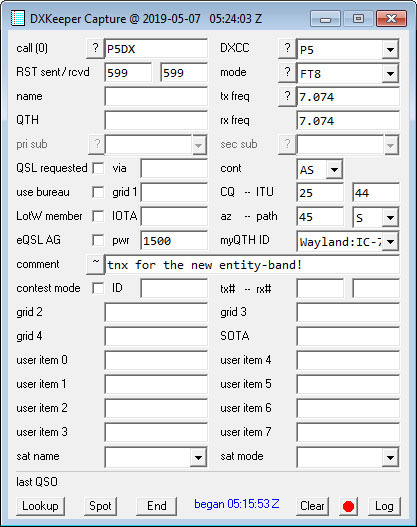 When the QSO is complete click the Log button. 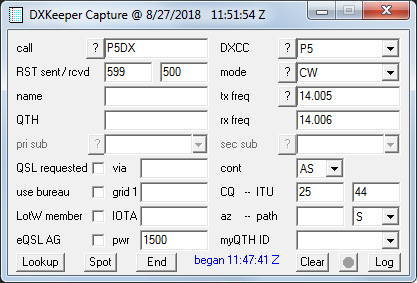 The logged QSO will appear in the Log Page Display at the bottom of the Main window's Log QSOs tab, and the Capture window will be ready to log the next QSO. If required items are missing or contain invalid values, clicking the Log button will highlight the labels of these items in red font, but will not enter the QSO into the current log; correct the errors, and then click the Log button.